January 12, 1927, was the day Lady Luck deserted Joseph Ginnetti, alias Joseph Gianetti, George Lamonte, and Henry Deland. For Joe was doing a two-year and eleven-month stretch in the Ohio State Penitentiary for a minor offense. A fairly secure place to be when you understand Ginnetti was badly "wanted" by the Providence, R. I., Police Dept. for having shot and killed his wife, her father and her uncle. Joe thought he was safe. But he forgot about those tell-tale finger prints he left behind in the Providence Police Dept., when he was there arrested in June, 1924, for Forgery. 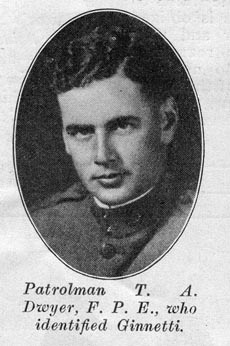 On that fatal day—January 12, 1927 (Blue Day for Joe! 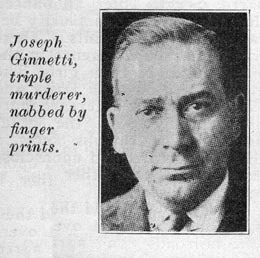 ), in the Detroit Bureau of Criminal Identification Patrolman Thomas A. Dwyer, F. P. E., came across a Providence circular bearing the finger prints of Ginnetti. On the same day, the Detroit Bureau had received some 66 photographs and finger prints from the Ohio State Penitentiary (of incoming prisoners), and F. P. E. Dwyer quickly noted the similarity between the prints of an Ohio State prisoner, "Henry Delano," and those of Ginnetti on the Providence circular. Identification was absolute and both Providence and Ohio State were notified. The big point this identification brings out is this: the great importance of continually receiving finger print records of incoming prisoners from the various penal institutions. Every bureau of i d e ntification should receive and send records for a man committed to prison on a minor offense may easily be wanted for another and worse crime elsewhere. The Detroit Police Department, its heads, and specifically the Bureau of Criminal Identification is to be warmly commended upon their splendid efficiency in this matter of exchange records and for their identification of Ginnetti. 1. "Triple Murderer Indentified by His Finger Prints", Finger Print and Identification Magazine, Vol. 8, No. 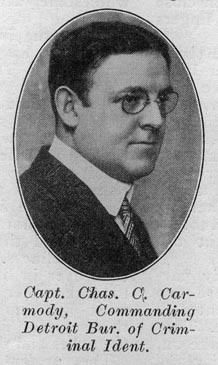 11, May 1927, page 8. Are you looking for GINNETTI ancestors? If so, we suggest posting a query to our Community Message Board to get assistance from other researchers.